Loyalty, as only a dog can do it! 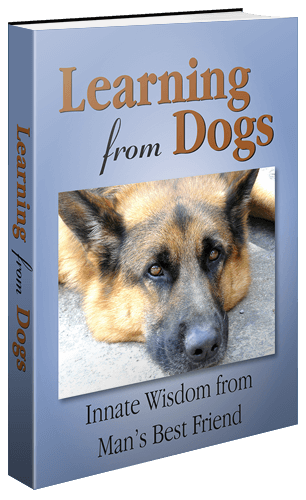 On January 4th, the Care2 site published what has to be one of the most remarkable examples of the loyalty of a dog. This is about as perfect an example of what we humans can learn from our dogs as it gets! If you’ve ever had the slightest doubt about just how loyal dogs can be – not only to people but to other dogs – a pup who’s been named Panda really proved it on Christmas Day. Panda and his pal, now named Lucy, apparently escaped from their home in western Ukraine and somehow ended up on railroad tracks in the town of Uzhhorod. Lucy had an injury and was unable to stand or move. Panda remained right by her side, warming her with his body in the freezing cold. A train engineer contacted a group of animal rescue volunteers including Denis Malafeyev, telling them he’d seen the dogs on the tracks for two days. Malafeyev and the others took off to try to save them. A viral video Malafeyev posted shows the dogs being run over by the speeding train. It’s chilling to think that this wasn’t the first time this happened to the dogs. The video is disturbing and difficult to watch, but amazingly, both dogs survived with just minor injuries. It may also seem disturbing that, knowing a train would be approaching, Malafeyev didn’t put down his camera and save the dogs. He wrote in his Facebook post that he and the group had tried, unsuccessfully, to move them, but Panda would bark at them and refuse to let them get close to Lucy. The video has been viewed more than 1.5 million times, with many commenters agreeing with Malafeyev that humans have a lot to learn from this dog. Lucy had no fractures, but only severe bruising, The Sun reports. Hopefully Panda will be rewarded with treats for his heroic actions, and the owners will make their home more escape proof. I am going to close this post by including another YouTube video of this incredible act together with the text supporting this video. Incredible Story of Devotion Dog! The dog two days guarded wounded friend on the rails! On Sunday, December 25 near the village of Uzhgorod in the district of Tyyglash a touching story took place in Ukraine. 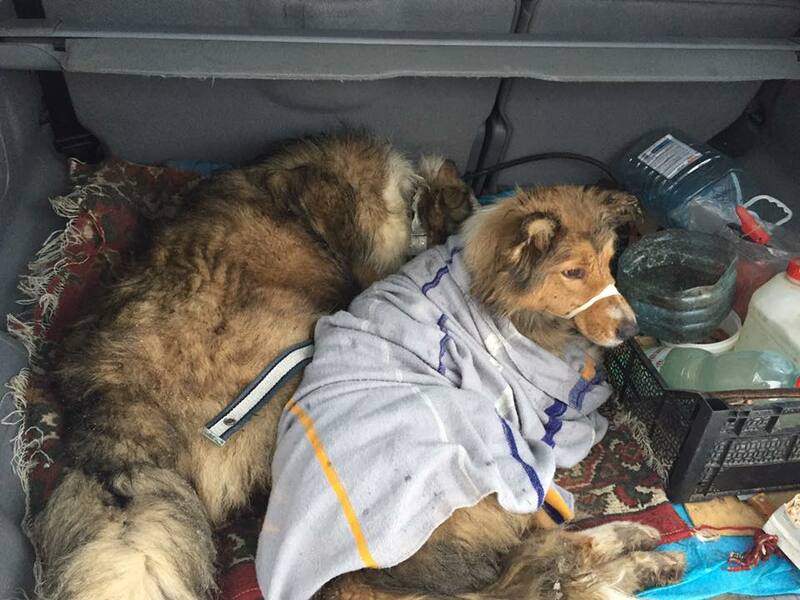 Two dogs spent about two days on the tracks, one of them was injured, and the other kept the injured dog warmed and protected from the passing trains. The story was posted on his page on facebook user Denis Malafeev. 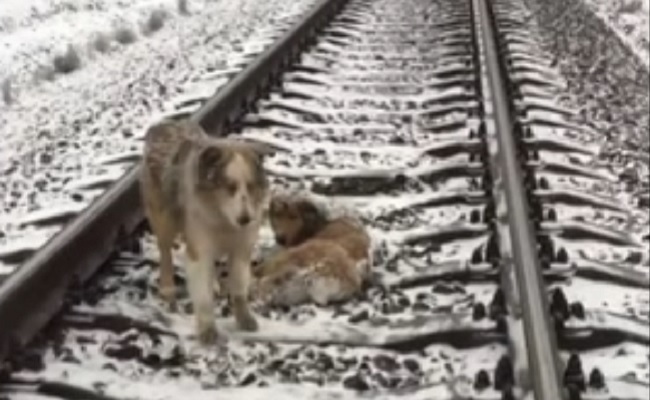 His friends noticed two dogs lying on the tracks, one of them was injured. Later, the man himself arrived on the scene. Several attempts to remove the animal from the rails were in vain, because the dog strongly defended her friend from the people! When the animals heard an approaching train, the healthy dog lay next to a wounded dog and together they were pressed to the ground between the rails. This moment Malafeev managed to capture on video. The dog did it for two days in a row! Just think! He warmed it for two days, so that it did not freeze and put himself in danger every time! I do not know how to call it: the instinct, love, friendship, loyalty? It is instructive for us! Together with his friends, they took dogs and took them to the shelter. The Post reports that they are now waiting for their owners. P.S. Shortly after the publication in social networks there were dog owners. It was learned that the Pandas and Lucy – so call the animals – there are no serious injuries, only bruises and hematomas. I found out that shaggy live in the home side’s S. Tseglovka in Transcarpathia for several years and are committed to each other from puppyhood. Dogs run away from home when someone from the house forgot to close the door on the site. They searched all over the village. But when the owners heard the story of “Romeo and Juliet” on track – immediately rushed to pick up pets from the shelter. Now dogs are at home, and their life is not threatened. For two days that one dog protected the other. It is beyond imagination to think how frightening a speeding train would have been for those two precious dogs. Not just once but numerous times before rescue came to them. Such a privilege to be able to share this with you. Tony, my thanks join your thanks to those that published this account in the first place. Incredible! As wonderful as it gets, John. Great to hear from you. I can’t bring myself to search for it (it saddens me too much) but there is a video (from Chili, I think) of a pair of dogs, best friends self-evidently, on a highway. One is hit and killed but the other does not leave its side. Slowly, he drags the body through the traffic to the emergency lane and stays with his friend. All of it was caught on CC footage. Ouch! Like you, I’m not sure we could watch that at this end. Big hugs, John. They really deserve love, comfort and happiness for the rest of their lives. Have a peaceful weekend. Can’t watch the video, but the story is so heartwarming. I love dogs. Just saw an old dog friend today – we met when he was injured getting picked on by another dog. This dog guy is such a softie! Now he’s injured again, but his owner who was beating himself up for letting the other dog near (a kid was walking it and asked if his dog was friendly, and my friend said,’Sure!’ Then the attack happened …) said, “We’re always learning.” And they are. He takes such good care of this beautiful guy. Good for them, I say. And so say all of us. Lovely anecdote from you. Thank you! This is exactly why I love animals and in particular dogs. Their loyalty is beyond reproach. They don’t care how rich you are, what you look like, how smart you are, they have no conditions on their feelings. A beautiful share, Paul! BTW, it is 4 degrees here in my neck of the woods. The snow is pristine and beautiful. Susan, you so beautifully encapsulate the nature of a dog’s unconditional love. Perfect! 4 degrees (-16 in my language). That is cold with a capital “C”. Take care! Doing nicely & very warm. Such a beautiful story and lovely ending Paul.. but I couldn’t watch the video even though I know it was a happy outcome.. I hope you are keeping warm and the snow is less.. Europe is having its share at the moment.. Thank you, Sue. The thaw, albeit slow, has arrived but already this morning we have had over an inch of rain since midnight! Hoping it will be possible to get out on to Hugo Road either late today, or more likely tomorrow morning. Warm hugs returned your way! We had three inches yesterday! It isn’t light yet so can’t report what is greeting us today. Incredible story. Dogs are more devoted than most humans. I am still wondering why it took the man who saw the dogs two entire days to find someone that could get the injured dog off the track. My understanding, possibly not perfect, is that the ‘nurse’ dog was being very aggressive towards strangers coming across to them. But that only makes the story more incredible; doesn’t it! Yes, it does- for sure. Welcome! Thank you for calling by and I hope to see you again. Just been across to your place and I’ll give you some feedback later on today. I will leave it as a response to your latest post. Ah what a story. I guess it is a happy one, though also so sad in parts. And yes, what loyalty dogs have. I often think about pretending to lie about hurt under a bush to see what my Labrador would do. Probably, lick me to death knowing him…..
Well done! Yes, so many examples of the loyalty of our fabulous dogs! Give your Lab a big cuddle from Oregon!